Spacious hallway with flagstone flooring, bureau, and coat and boots/utility cupboard. Kitchen/Dining Area: Large, light and airy "live-in" farmhouse style kitchen with wooden floors and original beams. Well-equipped with twin Belfast sinks, built in electric cooker and gas hob, built in dishwasher, toaster, TV, ipod dock, dresser and table & chairs to seat 10. There are French doors leading to the decked terrace, barbecue and enclosed garden. Utility Room: A useful room with a washing machine, tumble dryer, fridge/freezer, microwave, and a door door leading out to the drive. Bedroom 3: Beautifully presented double room with views over the garden, bedside tables and lamps, chest of drawers and a built-in wardrobe. Shower Room: Large high quality shower room with limestone floor and tiles, spacious walk-in power shower, hand basin and WC. Bedroom 2: Beautifully presented double room with views over the garden, bedside tables and lamps, chest of drawers and built-in wardrobe. Bedroom 4: Has full-size bunk beds, built-in wardrobe, lamp and chest of drawers. Sitting Room: A stunning spacious living room with double height ceiling, dual aspect windows, original beams and a wood-burning stove. This room has been beautifully furnished with a bespoke large comfortable sofa, armchairs and occasional chairs, coffee table, flatscreen digital TV with Sky package which includes Sky Movies, DVD player, Bluetooth speakers and free wifi. Bedroom 1: A luxurious boutique hotel style master bedroom overlooking the garden which has a has a king-sized bed, bedside tables and lamps, a chest of drawers and a built-in wardrobe. En-suite bathroom: gorgeous bathroom with twin hand basins, roll-top bath with shower mixer taps and WC. 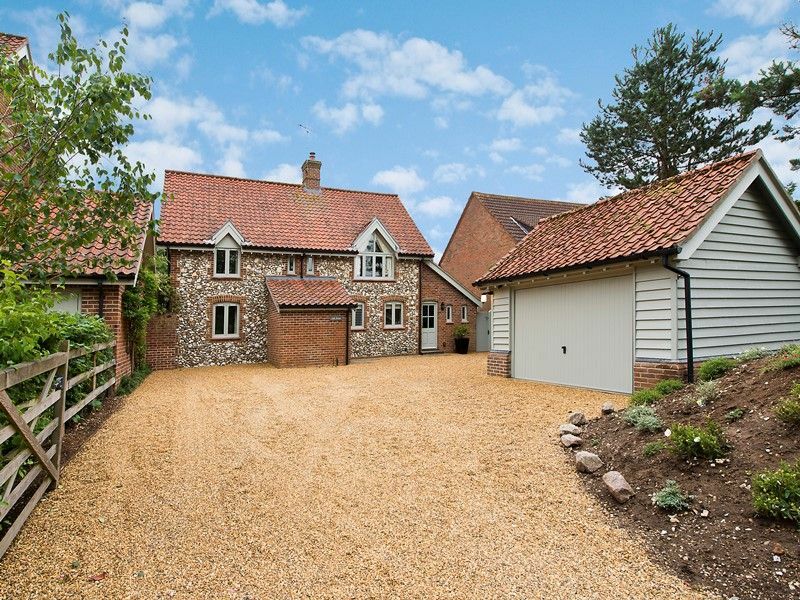 There is plenty of space for off-street parking for 3 cars in the large shingle driveway at the front of the house. A lovely, spacious rear garden with decked terrace area and steps leading to the lawn is perfect for alfresco dining and has teak furniture seating 8, umbrella and a Weber barbecue. It is only a minute's walk to Burnham Market's village green with its excellent selection of shops and galleries, and the renowned Hoste Arms pub and hotel for a delicious meal or a spot of pampering in the Beauty Spa. Please note that due to the exceptionally high standard that Lark House has been refurbished to, whilst the house will accommodate up to 8 guests, the new owners have requested that there's a maximum of 6 guests per stay. The house has been fully refurbished with exceptional attention to detail and a strong focus on quality of finish and contents, so please note that due to the high quality of the fixtures and fittings, the security deposit for Lark House is £500.00. Please note that the charge for a 3 night short break is 80% of the prevailing weekly rate.